last year my friend from japan came to visit & brought with her a ton of matcha flavoured treats for us to try. matcha is a specially blended green tea powder from japan that is incorporated into various foods, drinks & desserts. while some of the treats i tried were a bit too strong for my liking, the thing i loved most was the green tea kit kat bar. they have SO many unqiue flavours of kit kat available, omg. the combination of the sweet white chocolate & earthy matcha made for the most perfect pairing. well i have yet to come across it again, today's cake is inspired by that green tea kit kat! 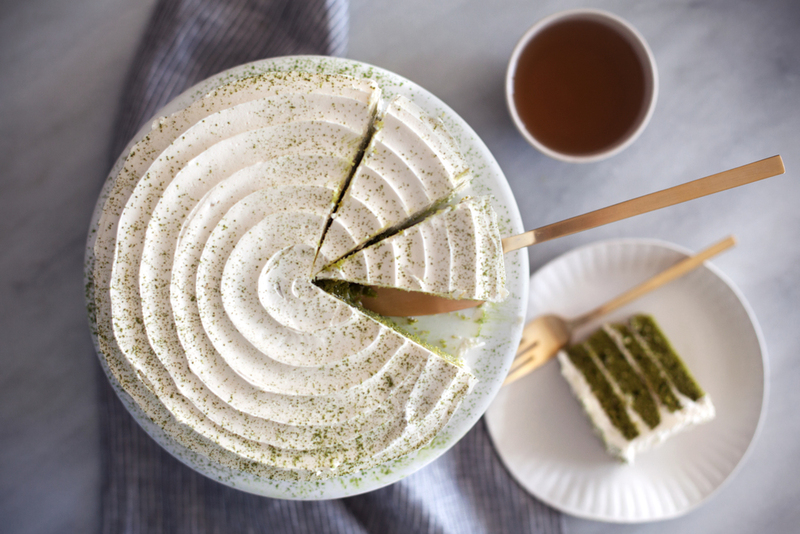 a matcha layer cake frosted with a creamy white chocolate buttercream. i was so tempted to add a little green tea powder to the frosting & make it an ombre cake.. maybe next time! i used aiya matcha's cooking grade blend which is specially blended for cooking & baking because it's aromas will come through even when the matcha is mixed with various ingredients! a little goes a long way. 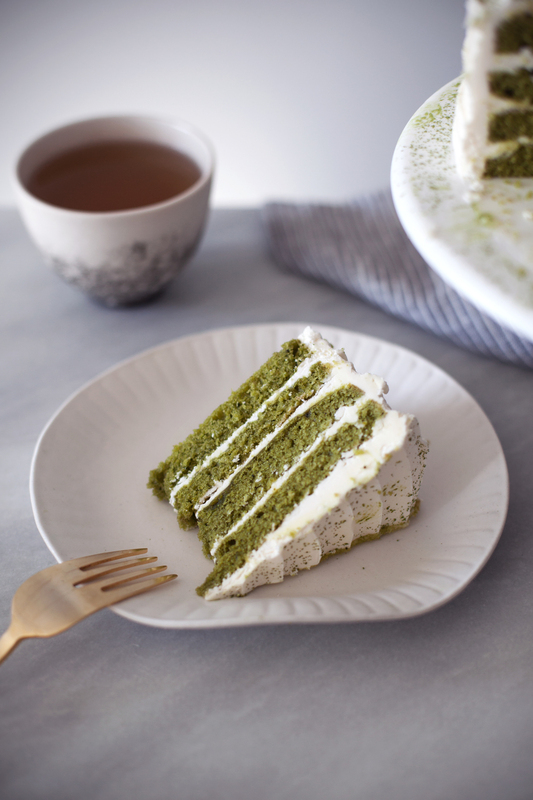 also, matcha is very healthy because it is high in antioxidants, making this cake healthy! right?!? in a mixing bowl cream butter, sugar & oil. add eggs one at a time. mix in milk, vanilla & matcha powder. in a separate bowl sift flour, baking powder & salt. add the dry ingredients to the wet ingredients & beat until fully incorporated. evenly divide batter between two greased & floured 8-inch cake pans. bake for 20-25 minutes, or until the cakes are fully cooked. let cool completely before flipping & frosting. once cakes have cooled, begin to make the frosting. using an electric mixture with the paddle attachment add butter, icing sugar & vanilla. mix until light & fluffy, about 5 minutes. slowly pour in the melted white chocolate until incorporated. frost cakes as desired & sprinkle with a touch of matcha!